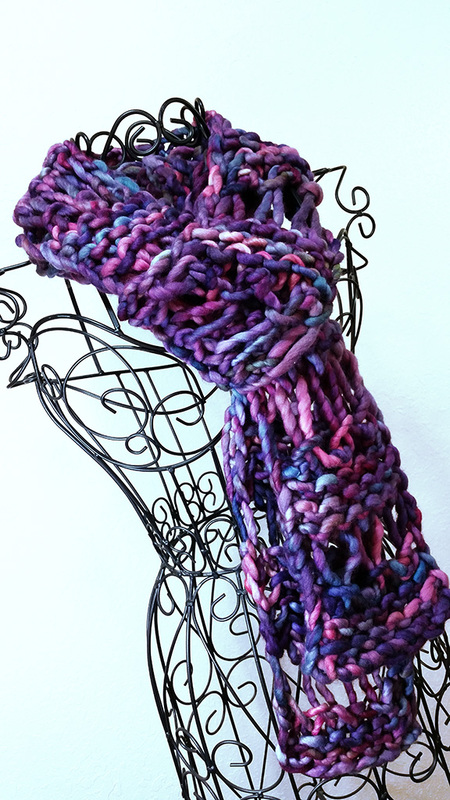 This lovely open stitch scarf is perfect for those days that are just cool enough to want a little extra warmth or just some added coziness in the form of delicious wool draped around your neck…mmmm, so soft! 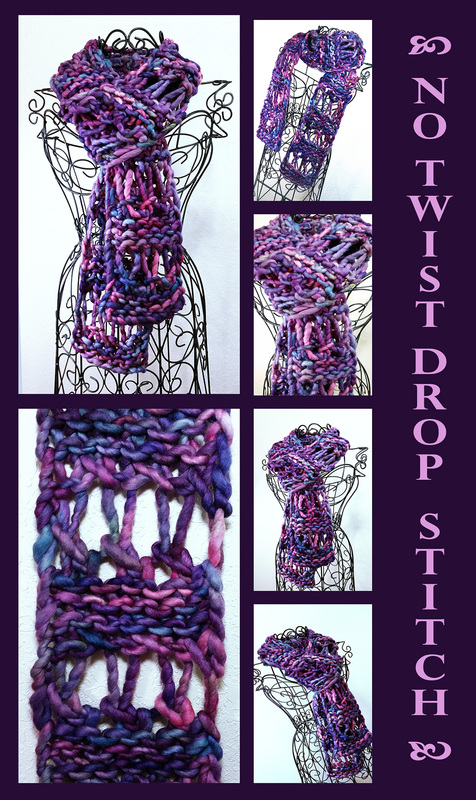 The way these drop stitches are formed creates sumptuous strands of beautiful color that drip down without any twists to interrupt the flow. Worn as a pop of color, or as a cool weather accessory, you can’t go wrong with this fun and elegant style. Knitting Loom: Zippy Loom: 16 pegs and 2 double knitting attachments used (all of which can be found in the Zippy Master Set). 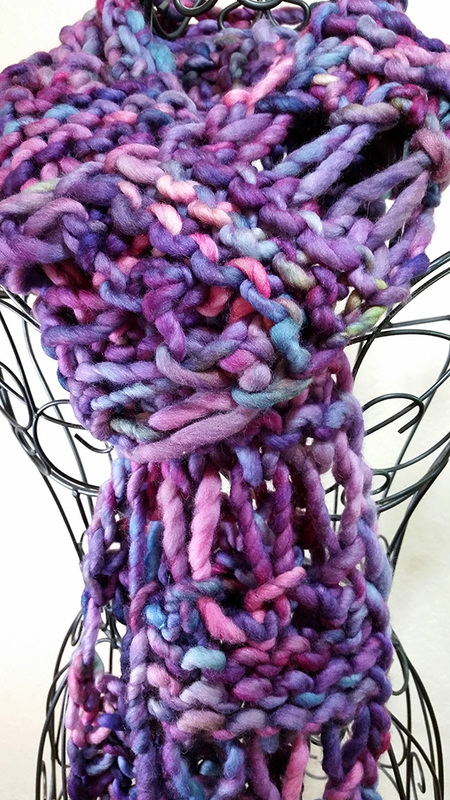 Yarn: Sample used approx 90 yards of super bulky yarn (Malabrigo Rasta, 1 skein in Iris, 90 yds/82 m, 100% merino wool). 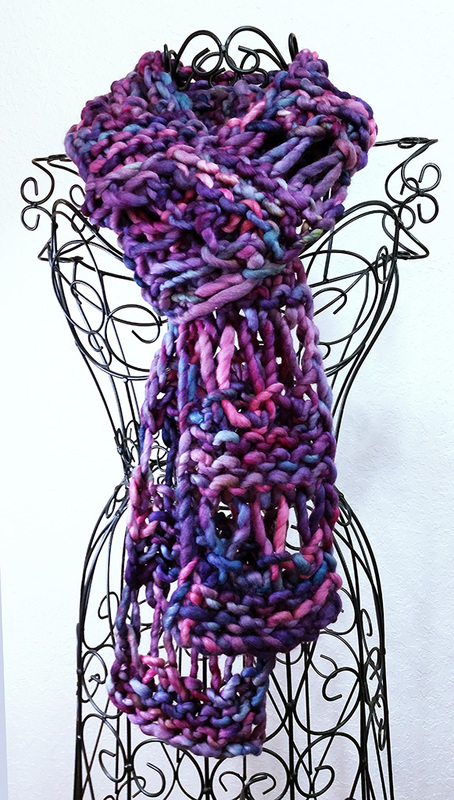 Depending on the yarn chosen and length of scarf desired, more or less yarn may be needed. Notions: knitting tool, scissors, yarn needle, row counter. Skills Needed: Knit/U-stitch, Purl, Half Hitch CO, Chain CO, and Basic BO. For the sample, all knit stitches were made using the U-stitch, except where otherwise noted. Half Hitch CO tutorial (but technique is also included in project tutorial above). Set Zippy loom to the double knit configuration using 8 peg pairs. CO from left to right onto the front 8 pegs only (the back pegs will be left alone for now). Peg 1 will be at the right end. Row B: s1, p6, k1. Peg 8: k1, EW 2 times, also on peg 8. Peg 1: k1, EW 2 times, also on peg 1. Rep Rows 1-8 to length of scarf desired, minus 6 rows. Finishing Rows: Rep Rows 1-6. BBO loosely. Secure and weave in all ends. This entry was posted in Free Loom Patterns, Knitting, Loom Knitting, Looming Patterns, Looms, New Projects, Product Review, Tutorials and tagged Authentic Knitting Board, Bethany Dailey, Free Loom Knitting Patterns, Gettin' It Pegged!, gettinitpegged, loom knitting, loom knitting patterns, New Product, No-Twist Drop Stitch Scarf, Zippy Loom, Zippy Master Set. Bookmark the permalink. Hi Bethany, just wondering since I have several sets of the Zippy Looms. Is there any way to buy just the attachment pieces w/o having to buy the whole set? Ohhh, such a pretty, posh, purple project, Sunshine ❤ Fantastic!